The Batcave - Hawkman; Justice League? Are the Thanagarians joining the fight? Unbelievably some eagle eyed person just maybe has found new evidence that may suggest that a surprising new ally might be joining the fight against Darkseid's army in the upcoming Justice League film, due in November of this year. We already know from reported set visits from early last year that Darkseid and his army of Parademons had previously visited Earth thousands of years ago and battled against an army of united Amazons, Atlanteans, and Humans. The recent teaser trailer confirmed that we would be seeing this battle, but it may have revealed a fourth ally in the war against Darkseid's army, the Thanagarians! Searching very slowly, frame by frame through the battle scene footage, humanoid beings can be spotted flying around in the background with large, bright, white wings attacking the Parademons from above. It's possible that they could simply be flying Parademons as seen in the rest of the trailer - however, on closer inspection, the Parademons seem to be firing their signature red weapons towards these winged beings. 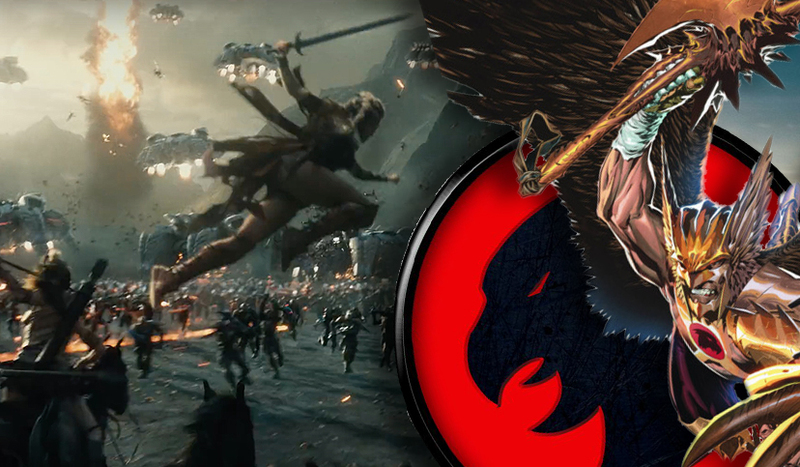 If the Thanagarians really were involved in defending Earth against Darkseid, it's possible we could see the arrival of the fan-favorite League members Hawkman and Hakwgirl a lot sooner than we thought. Check out the Trailer below and see what you think! Please, please PLEASE... let this be true! I want Warner Brothers to bring the true Hawkman to the big screen and give him the same treatment they've given Aquaman and correct the awful Hawkman that the CW attempted on Legends of Tomorrow!